Home / Blogging and Admin / Personal and Misc / Best Urban Chennai blogger- My first physical best blogger award! Best Urban Chennai blogger- My first physical best blogger award! This happened last Saturday but had to wait till now as I was pre-occupied with other things. 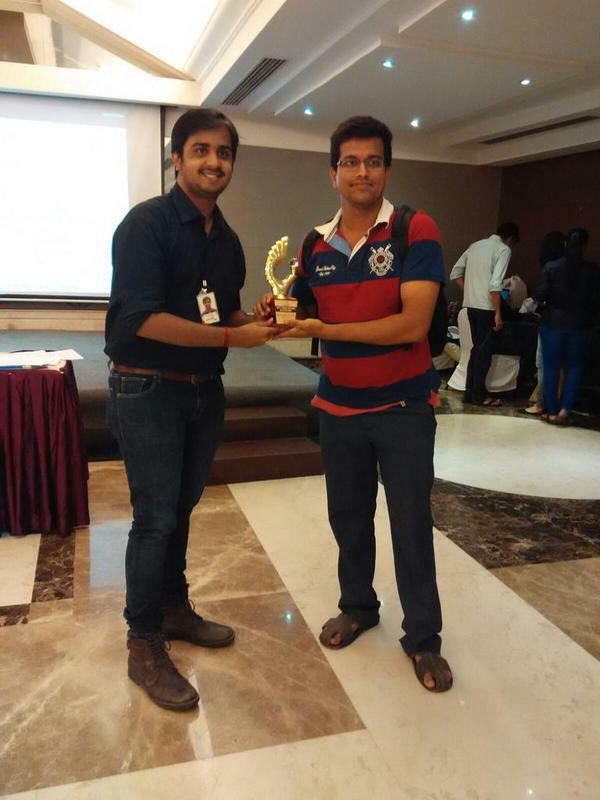 Last Saturday I received a Best Blogger Award, titled "Best Urban Chennai Blogger"- not from another website that lists top list of top bloggers, but a physical one from EchovMe, a Chennai based social media training and consulting time. EchovMe, in association with Urban Tree, a leading property developers in Chennai organized a Chennai Bloggers’ Meet last Saturday. Part of the event agenda was to give away awards to best social influencers in Chennai, including Bloggers, tweeps and others. I got to know about this Bloggers’ meet last Monday when I was in Ahmadabad. There haven’t been any big blogger meets in Chennai in recent times- we could only catch up with other bloggers during some corporate events like Dunkin Donut launch, Annalaya launch etc, so this event, a proper-bloggers meet was not to be missed. But I also had some plans for the weekend- relatives were coming in and we were to drive around Vellore, Yelagiri and few other places. Since bloggers meet was only for few hours, I figured out that I can manage both- proceed with road trip as planned, but be back little early to attend the bloggers meet. So I registered myself for the bloggers meet and when organziers called me to confirm my attendance, I did confirm that I will be coming but I might be little late. Saturday morning half went as planned, but return was little delayed. I reached outskirts of Chennai by, dropped my relatives off at Choki Dhani and began heading to the event venue- Beverly Hotel off Poonamalle high road. This spot was some 25 kms from Choki Dhani but took full 90 minutes to cover due to heavy evening city traffic. For a moment I thought of backing out from driving all the way, but then I had made a promise and I had to keep it. Even if event starts and ends on time, people will be around for some more time, so I can still say Hi to fellow bloggers. So I decided to proceed. Enroute, a cop pulled me over and wanted to understand if I am driving a taxi (I was driving Carzonrent’s Grand i10 with yellow numbers on black board). I showed him all paperwork and explained that it is a company registered car and there’re all necessary permits to rent it. Then he let me go. Reached the venue, handed over the key to valet and rushed inside. People at the counter said I have a surprise awaiting and asked me to go inside. I asked if I should fill any form or any other registration formalities- they said no need. Once inside, I could spot Sandeep Varma, Sarath Babu, Rajesh and other regulars. One of them hinted me that I won an award. The meet had just concluded and everyone were having snacks. I went ahead and said Hi to Sorav Jain, Thinker in Chief of EchovMe (An attention grabbing title instead of conventional CEO). He announced my arrival and handed me the award- The EchovMe, Urban Blogger award. The award memento was very trendy design and custom printed name and blog details. I wasn’t well prepared for the event and hadn’t prepared my victory speech, so wasn’t sure what to say- said a few words thanking the organizers for the award and apologized for being late and handed the mic back to Sorav. Spend another half an hour chatting with the bloggers, having some refreshments etc. Got to know that event went very well and participants had fun. There was Tambola game, group activities and other fun stuff. I missed all the action, but I am glad I could at least make it to the venue and meet the organizers and fellow bloggers. Sarath Babu and Sathya won best twitter influencer award. Aarti Krishnakumar, Praveen Kumar, Gandadharani and Pradeep Kumar also won Best Blog/Best blogger award. Asked Rajesh to click my picture (first photo of this post) along with my Prize and event backdrop. Thanks to him for the pic. While it is good to celebrate a reward, I also want to take a moment to explain the process- everyone who registered for the bloggers meet had an option to tick if they want their blog to be considered for the awards. Naturally I clicked yes and am sure everyone else also would have clicked the same. But if there were some good bloggers who didn’t notice this event or couldn’t register/nominate probably they missed out on getting evaluated for the award. Since most of Chennai’s blogging community were there at the event, I am hoping no deserving bloggers were left out. The title is Best Urban Chennai blogger- Urban being name of the sponsor, UrbanTree. But also it indicates that this is a Chennai city level award. I still have a long way to cover to bag similar awards at national/international level. I will keep doing what I like the most and keep writing what I feel will add best value to readers. Let us see how future takes shape. I end this post by thanking EchovMe and Urban Tree for the recognition and all my readers and friends for the appreciation and support shown. A more detailed event report with other winner details is available here on Urban Tree's blog. Hearty congratulations with best wishes for many more!! Many thanks for attending #UrbanChennai Blogger's Meet and Awards. You totally deserved this award for the years of quality effort you have put in place. Congratulations from Urban Tree Team once again. Thanks for writing about it. Thank you for making time to attend the #UrbanChennai Blogger's Meet and Awards. Many congratulations on winning the award! We wish you good luck for all your endeavours!